[CHARGING DOCK] – Ultra-low power consumption, which allows for 3 hours of premium quality play time. And also enjoy your music with this headset. No more worry about the lack of battery power, will not lose any call or stop music. [Quality Stereo Sound] – Crisp, crystal-clear sound quality and robust bass are realized through Dual Wireless Headsets. Bluetooth pairing, power on and power off, pretty easy to use., third-way calling and incoming calls prompt that satisfy all your needs! 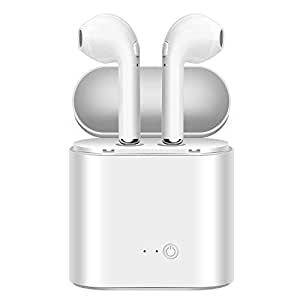 [FAST AND STABLE CONNECTION & WIDE RANGE] – Advanced bluetooth V4.2+DER (Enhanced Data Rate) system let you enjoy high-fidelity sound with the bluetooth earbuds, faster pairing speed and stable connectivity. The bluetooth connection range up to 33 feet (10m), if your smartphone put in the bedroom, you can still enjoy music or never miss any calls when you are in the kitchen. Support Twins Pairing and Single Pairing. Long press the power button of the pair of earphones at the same time until the led flash in blue and red alternately. The both of them have a voice say”power on”, and then “pairing”. (Voice Notice: Twin Successful – Wait Connection) Long Service Time: Built-in high performance rechargeable Lithium-poly 60mAh battery. High capacity battery provides 3- 4 hours call time or music playtime at 40-50% volume, full charge in around 1-2 hours and up to 120 hours standby time. Support Stream Music/Video/Audio. Its hands-free function would release your hands from answering the call during driving or walking. It designed with noise reduction and echo cancellation technology to filter ambient noise and enable clearer sound during calls and when listening to music. Compatible with almost all the Android, Apple, Microsoft, Saipan system with Bluetooth mobile phone.